Fairfax County is expected to move forward with proposed zoning changes for Reston that would increase the population density. After 17 months of public engagement, the county’s Board of Supervisors is anticipated to authorize public hearings on the zoning changes for early next year at its Dec. 4 meeting, the county announced Monday (Nov. 19). The meeting will not be an opportunity for public input, the statement said. 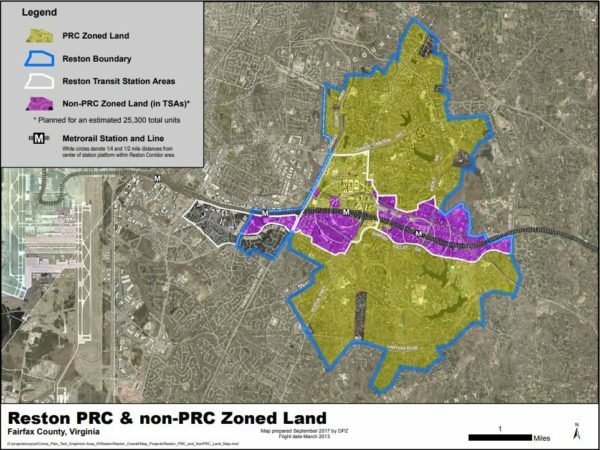 The proposal would increase the maximum allowed population per acre in the Planned Residential Community (PRC) district — Reston’s primary zoning district — from 13 persons up to 15. The current density is roughly 12.46 people per acre. “This 13-persons per acre limit has remained unchanged for several decades and does not accommodate the future residential growth anticipated in the Reston PRC near the future Silver Line Metrorail stations,” the statement said. The proposal would also up the limit of 50 dwelling units per acre to 70 in the transit station areas planned for mixed-use development. This would mainly affect the Reston Town Center Transit Station Area, according to the statement. County officials began small workgroup sessions hosted by the Coalition for a Planned Reston, a grassroots organization and Reston Association in July to discuss the controversial plan. County planning officials have argued that the Reston PRC zoning change is needed to put into action Reston’s Master Plan, which allows for future growth over the next 40 years, especially around the Silver Line Metrorail stations. Last September, Reston 20/20, Reclaim Reston and the Reston Citizens Association encouraged Restonians to fight the County’s proposal, which then had the bump on the people per acre in the PRC District from 13 to 16. Coalition for a Planned Reston sent a letter Aug. 1 to Hunter Mill District Supervisor Cathy Hudgins to urge her to continue suspending further action on the zoning amendment while discussions were ongoing between the Reston community and Fairfax County staff. Reston Association sent two letters last year to Hudgins. The first one expressed opposition to the amendment as currently proposed, and the second letter included a list of actions that should be undertaken before the amendment is considered any further by the county.